The supremely well located Dar Les Cigognes faces the gates of the Royal Palace in the heart of the historic medina. With most of the major sites just steps from our front door, the bustle of the souks and adjacent Place des Ferblantiers, Dar Les Cigognes is a convenient base for a visit to Marrakech. As one of the very few riad hotels located on a street, Dar Les Cigognes offers guests the additional ease of being able to come and go by car. For centuries, a discreet door opposite the gates to Marrakech's Royal Palace led to a wealthy merchant's home. Today, behind that door, with the help of celebrity architect Charles Boccara, we have transformed two Riads into the luxury boutique hotel called Dar Les Cigognes. A Riad is a traditional Arab house, traditionally an interior world, which is built around a courtyard with fruit trees and a fountain. A stay at Dar Les Cigognes offers a rare glimpse into a world from 1,001 Nights, with all the comfort and luxury of a modern boutique hotel. There are just eleven rooms at our riad, making it a true boutique hotel, and ensuring that you will have one of the more private and individual experiences in Marrakech. Our goal is to provide the comfort and ease of home, with great service. Refined elegance and style are the hallmarks of this charming small Marrakech hotel. Dar Les Cigognes offers all the comfort and calm you would expect from a luxury boutique hotel, as well as the chic and charm of Moroccan style and fashion. Each room is unique, drawing on the rich cultural heritage of Moorish art and décor. The bedrooms and bathrooms have been designed with the highest level of well-being in mind, and friendly and attentive service will make you feel at home. If you are planning to travel to Morocco, or plan a stay in Marrakech, Dar Les Cigognes offers the comfort and intimacy of a guesthouse with the service and quality of a hotel. For accommodation in Marrakech, look no further than Dar Les Cigognes. Marrakech, with its scented alleyways and mysterious riad houses, is a feast for the senses, a true thousand and one nights! Let yourself be seduced by the mystery, the beauty, and the luxury of this magical place, step back in time, and lose yourself on a trip to this beautiful land. Marrakech is a chic destination, as much for its stylish riad houses and small hotels, as for its vibrant restaurant scene and nightlife. After a feast of the senses, come home to charming hotel Dar Les Cigognes, a true Oasis of Calm. Dar Les Cigognes is now a proud part of The Sanssouci Collection of Marrakech Riads. 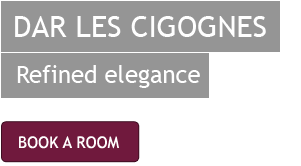 For more information, please contact us at info@lescigognes.com. Email: info@lescigognes.com or for general information about Dar Les Cigognes, please write to us at info@sanssoucicollection.com.